See you in Garden Bloc, Cebu I.T. Park on Nov. 23! Sun brings together powerhouse Cebuano artists for ‘Para Nimo, Cebu’, Ang Pinakalingaw Nga Concert, on November 23, Friday, at the Garden Bloc, Cebu I.T. Park, Cebu City. SUN Cellular's "Para Nimo Cebu"
This highlights Cebu’s homegrown artists including Mandaue Nights, Honeydrop, Three Legged Men, FOC Fashion, Sunday Sunday, Shiela and the Insects, and Silingan ni Felicity, as well as top Cebuano singers including Jacky Chang, Jewel Villaflores and Kurt Fick. Also joining the fray are some of the country’s top artists including Unique Salonga, Clara Benin, and alternative rock bands Sandwich and Ang Bandang Shirley. Cebuanos can now experience Sun LTE through Sun’s best value data, calls and texts promos, including the new Sulit Surf Plus 20, which comes with 300MB open access data, unlimited text to all networks, and unlimited SUN, Smart and TNT calls valid for 2 days for only Php20. 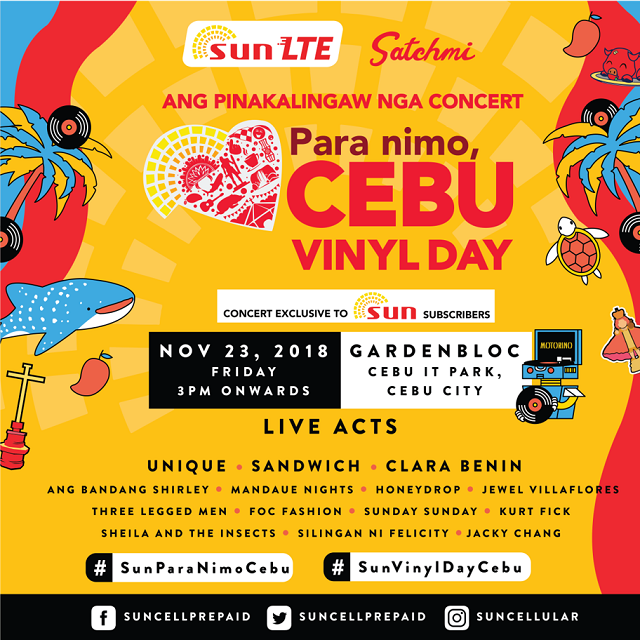 As a big treat, loyal and new Sun customers in Cebu can get a complimentary pass to ‘Para Nimo, Cebu’ concert as well as enjoy fun and exciting activities at the event. Sun customers can get 1 complimentary pass to ‘Para Nimo, Cebu’ concert by registering to Sulit Surf Plus 20. Sun subscribers can also score 3 or 5 complimentary passes by registering to Sulit Surf 99 or Sulit Surf 249, respectively. Sun customers can load up and claim complimentary passes at designated areas, such as in Parkmall; Innodata in Mandaue City; Copytrade in Sanciangko cor. Osmena St in Cebu City; near Gaisano Grand Fiesta Mall Tabunok, and Across Super Metro Lapu Lapu. On the other hand, new Sun customers can get a complimentary pass by first activating a new Sun LTE-ready SIM and registering to corresponding Sun’s Sulit Surf Plus packages. Don’t miss your favorite Cebuano artists in one big music celebration! For more information, follow Sun Prepaid’s official accounts on Facebook (www.facebook.com/SunCellPrepaid) and Twitter (@suncelldeals).